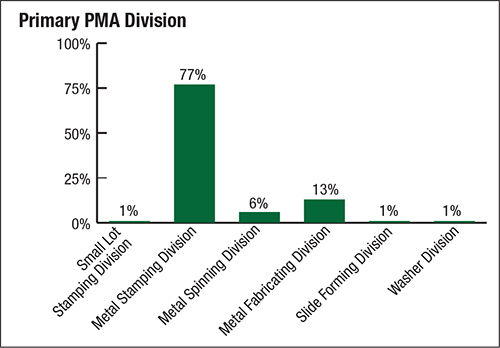 The 2015 Precision Metalforming Association (PMA) Benchmarking Report for the Metalforming Industry shows that the overall health of the industry has stabilized, in the wake of a few years of strong growth. Here are some highlights from the report. 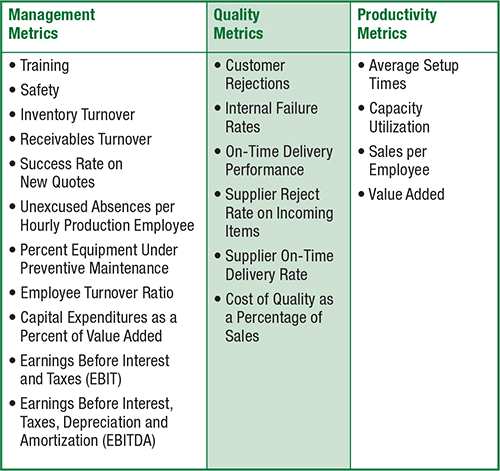 The survey helps metalforming companies measure and compare their performance against the industry average of more than 50 metrics in the areas of management, quality and productivity. Survey participants also can compare their performance against “best-in-class performers” (companies in the 90th percentile for a given metric) and the “most profitable performers” (those companies with the highest average profitability). This year, 82 companies participated in the survey, primarily metal stampers supplying a variety of industries. • 77 percent of respondents identified themselves as metal stampers, 13 percent metal fabricators and 6 percent metal spinners. 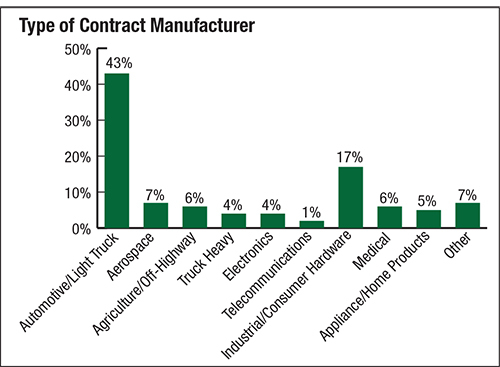 • 43 percent of respondents supply primarily the automotive industry, followed by Industrial/consumer hardware at 17 percent and aerospace at 7 percent. 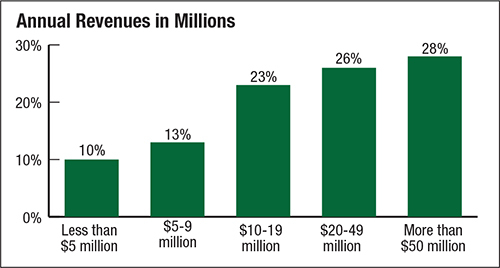 • 28 percent of the companies included have sales exceeding $50 million, and 26 percent have sales between $20 million and $49 million. 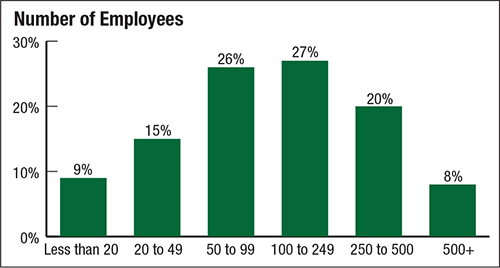 • 27 percent of survey participants have between 100 and 249 employees; 26 percent employ 50 to 100 people; and 20 percent have 250 to 500 employees. • 84 percent of participants operate with nonunion workforces. Are volumes up compared to the prior year? To find out, PMA tracks the results of repeat participants—59 companies participated in both the 2015 and 2014 surveys. These 59 companies reported a combined total value of shipments (sales) of $2.38 billion in 2015 as compared to $2.21 billion in 2014, an increase of 7.71 percent. 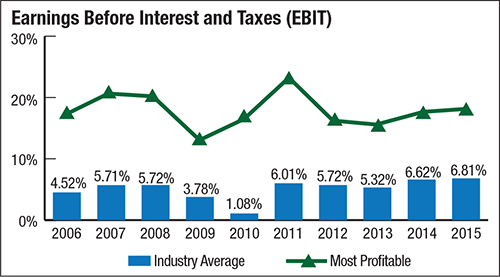 The survey also benchmarks industry profitability, by measuring earnings before interest and taxes (EBIT), viewed as an equivalent to a company’s operating income. Average EBIT during the last 10 yr. has consistently ranged between of 5 and 6 percent of sales, with the exception of the years impacted by the economic downturn in 2008 and 2009. In 2015, the EBIT calculation came in at 6.81 percent, the highest rate in the past 10 yr. The most-profitable companies have reported average EBIT in the range of 13 to 25 percent of sales over the same 10-yr. period. 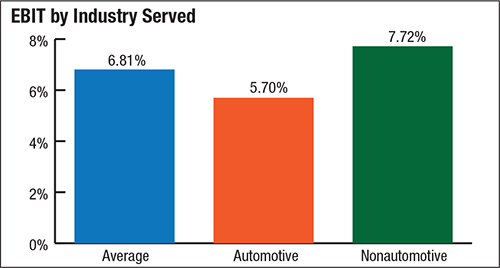 “What’s the profitability for automotive suppliers compared to nonautomotive?” In 2015 automotive suppliers enjoyed an average profitability of 5.7 percent, below the industry average of 6.81 percent. Nonautomotive companies were more profitable—an average of 7.72 percent. Based on discussions at recent PMA district meetings, the outlook for 2016 remains optimistic. Most organizations believe that the industry has stabilized, and most expect sales and profitability to increase slightly over 2015.